Original Title: Wem gehört die Welt? Hardcover with jacket, 680 pages, 15.0 x 22.7 cm, 5.9 x 8.9 in. The big report: who is behind the money that rules the world? They are called Larry Fink, Stephen Schwarzman or Abdullah bin Mohammed bin Saud al-Thani. They hide themselves behind investment funds, private equity or foundations. They dominate the central fields of the economy. To date, no one knows, who they really are, nor their intentions or aims. Who Owns the World systematically reveals the concentration of capital and power as a result of a global capitalism. 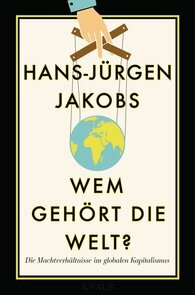 In cooperation with the Handelsblatt Research Institute and his fellow Handelsblatt correspondents, Hans-Jürgen Jakobs presents a comprehensive, first-time investigation into the true power relations governing today’s international financial markets. "Jakobs makes an appeal […] for stronger financial-market regulations. This fact-rich reference book also reveals how to better monitor the rich and powerful."